TomTom has announced the Vio, a £150 sat nav specifically designed for scooters. Available in a variety of vibrant colours, the tiny Vio unit mounts to scooter mirror stalks and is operated via a paired smartphone. It features traffic alerts, speed camera alerts and is waterproof. 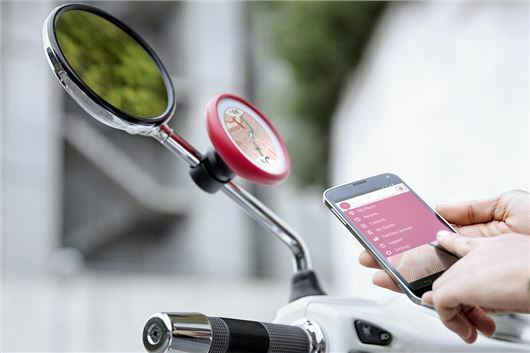 It can link up to a Bluetooth helmet headset to deliver voice instructions, or to enable the rider to take phone calls, with caller ID displayed on screen. There is a memory function for storing favourite locations for easy navigation without pulling over to set things up – so it’s the ideal companion for riding in busy town traffic. A full charge lasts five hours, so there’s no need to install wiring, plus there are alternative mounts to fit handle bars, should your bike have incompatible mirror stalks. It’s also glove-friendly, so can be easily operated on the move, plus it can be customised with different silicon covers. The display colour can be changed too, via the app - or it will change red to warn the rider they may be speeding. funny how it is designed for scooters yet it routes you like a car, maps don't stick to 50 MPH only roads!